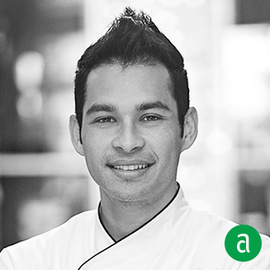 Benjamin Murray, Chef de Cuisine of Pao at Hotel Faena in Miami Beach, shares his career timeline and advice for up-and-coming talent. EVERY DAY. This has always stuck with me. Every day you have to be on top of your game, you have to be on time, you have to anticipate, you have to adapt, you have to get better. The guests don’t care that you’ve had a bad day, or that you got a flat tire on your way to work, or that the vendor you order from didn’t send the product you asked for. They expect perfection. EVERY DAY, EVERY PLATE. When hiring cooks, I look for good attitude and they must be quick on their feet. I can teach you how to cook, but I cannot teach attitude. Some of the best cooks I have ever seen are maybe not best technically, but they run and they always have a can do attitude. They never say no; no matter what is needed, they make it happen. They are the hardest working, they are the heartbeat of the kitchen, and they gain the most respect. A permanent marker is a life saver. I have to write things down or I will forget them. It's human nature to forget things. In a kitchen, you’re always working, someone is always asking you something, so I need to be able to write it down. When I’m expediting, I need my marker to organize myself and keep track of tickets, ticket times, tables and special requests. I could not live without it. In a kitchen, there are so many personalities and cultures. Everyone has a different story and background. If you’re willing to listen, you will find more information about them and food, than you ever imagined. Read, Watch, Eat. Read as much information as you can, whether it is in books, magazines or on the internet. Watch cooking videos of your favorite chefs, or videos about your favorite restaurants and find out what they are doing that makes them so successful. Eat. You don’t always have to eat at the trendiest restaurants to educate yourself. Eating a traditional Cuban meal at an establishment that has been there for 60 years is pretty educational in itself. But don’t forget to save some money to ensure you can experience the most inspirational and amazing restaurants you’ve been dreaming to go and visit. It will most likely change your perception of food. Three books that have had an impact on my career are: Alinea by Grant Achatz, The French Laundry and Under Pressure by Thomas Keller.